Spong’s argument is that the generations raised in this kind of doctrine- and creed-based church environment, become closed-minded, racist, sexist, homophobic adults who are ignorant to the facts so clearly visible in the known universe. Ultimately, what he recommends is the creation of a new church — not Christianity 3.0, but a full re-boot. A Christianity that returns us to the original teachings, mission and ministry of Jesus Christ. It’s a bold and well-articulated statement that is worthy of discussion in every Christian church around the world. How influenced by the theistic concept of God is the Christian myth of Jesus? And, when you move beyond theism to post-modern understandings of The Christ, are you still considered a Christian? Spong doesn’t leave us alone entirely to wrestle with these questions. He provides some details of what his vision for the new “Ecclesia” will be. The qualities of this new church/not-a-church will include things like: community (people gathering and finding meaningful connection), sacred stories (myths), a sense of ecological and biological interdependence (Gaia, web of life), self-consciousness and self-awareness in individuals, an emphasis on human welfare (universal compassion), and the importance of ritual (religious and spiritual practice) for individuals and families. 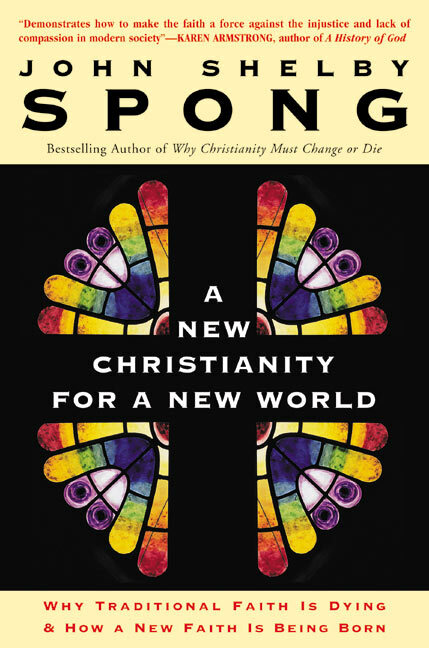 Spong has an exhaustive body of work, and frankly, I find it interesting that he has not gained more traction among the progressives and modern/contemporary Christian churches. Then again, maybe he has. Maybe there are classes being taught and book discussions being held right now by church members totally amped-up for a new and fresh version of Christianity for the post-modern age. If you’re out there, I want to hear from you. What do you think of Bishop Spong’s “Ecclesia?” Do you think that by stripping the Jesus story of the orthodox baggage, we arrive at a purer form of God-experience? And, do you think that we can still call that experience Christianity? This entry was posted on Tuesday, June 10th, 2014 at 11:07 pm	and tagged with Bishop John Shelby Spong, Christ, Christianity, Church, Ecclesia, Elaine Pagels, Gaia, Gnostic, Gnostic Gospels, Humanism, interdependence, John Dominic Crossan, Matthew Fox, mythology, orthodox, reform, Rev Dr. Matthew Fox, Unitarian Universalism and posted in Critique, Debate. You can follow any responses to this entry through the RSS 2.0 feed. « Interfaith Week is Coming to St. Petersburg! This whole idea of getting back to the true message of Jesus is a bit tired. We have no idea what his true message is short of the bible. If we can only base our ideas of Jesus (and god) from the bible, there is no wonder people fear a wraithful god, a god who condones slavery, misogyny, homophobia, etc. Everything written about Jesus/god is entirely derived from the same bible that does not preach “indiscriminate love for humanity.” Sure you can cherry pick and make Jesus/god out to be this all loving creator of everything, but the only source we have completely flies in the face of such an assertion. I agree the church needs to change and adapt to the understandings of our natural surroundings. But is the word of god changeable? If the bible is a mix of parables, morality, science, and history, how do we determine one from another when things that have been accepted as historically accurate by the church are proven false? This reinterpretation of the bible as our knowledge of the universe increases, seems silly and contrary to the message it seems to promote. Ken, I think we need to make a distinction between the Hebrew God of the Old Testament and the God of the New Testament (“I and the Father are one,” John 10:29-31). We should also take into account that there are not only multiple translations and versions of The Bible, but God and Jesus sound different in each of them. If we can agree that there are different “Gods” present in The Bible (or at the very least that God through the experience of Jesus is a very different God), can we also agree that this scripture itself is interpreted differently by different people, at different times, based on their culture and worldview? And, if so, then “reinterpretation … as our knowledge of the universe increases” doesn’t seem silly at all. It seems crucial. And it should happen daily. “Is the word of God changeable?” I would say, yes. Every time you hear it. And not because the situation (or “the word”) has changed, but because “I” have been transformed. It’s difficult to get past the stubbornness and denial. In reading his 12 points, they can easily be deduced to one simple admission: Christianity is fraudulent. Bold articulation doesn’t mask the fact that he’s shilling for a branded cash cow. Hunter, I have to say, this is my one sticking point. I believe that the movement Spong is spearheading will eventually cause a wider shift and reform among Christians. But, why not draw a line in the sand now and just create something new that’s not called “Christianity?” To clarify, are you saying that he’s being sensational with the words “Church” and “Christianity” in the titles of his books and writings in order to market them to a “Christian” audience? If so, I agree, but that is the target audience, no? One may not totally agree with everything or word from Bishop Spong’s book but he is asking relevant questions which are bound to provoke more questions. For instance, how truthful is the account of Jesus as revealed from the Bible? And why is there no record of Jesus’ writings? Like, Gospel of Jesus or Book of Jesus? Why are we left with only people’s quotations and interpretations of his words and actions? For someone who started very early to question authorities in the Synagogues, how come we cannot pick up any book by him today? So, there must be a reason or conspiracy to deny the world the truth surrounding Jesus and his mission which has produced so many billionaires and millionaires who have cleaned up by preaching and teaching the world about about Jesus and the Church. But there will be no end, until the end of the beginning? Denial of Theism, denial of Jesus’ Divinity, denial of the virgin birth, denial of the resurrection, and denial of prayers to a personal deity. Guess we know where this tired conversation is going!